A delicious sweet potato, fluffy on the inside and crispy on the outside, topped with a super quick and easy homemade chili, this healthy sweet potato is my favourite dish to tuck into on chilly weeknights. You can bake the potato the proper way in the oven for the most amazing crunchy skin, or speed things up and cook it in the microwave in just 8 minutes! I don’t post much savoury stuff on Happy Healthy Motivated. So you know when I do post something that’s not a brownie recipe or cookie dough flavoured it’s got to be amazing. And let me tell you, this healthy baked sweet potato is just that. The last savoury recipe I published was The Most Amazing Honey Glazed Carrots and Parsnips and this potato is every bit as good as they are. I’d even go as far as saying it’s better because it’s an entire meal on its own and (if you use the sneaky microwave method to “bake” the potato) the whole thing can be ready in 20 minutes! It was a cold, blustery winter’s night. (I know I live at the beach, but it still gets cold and windy around here…sometimes!) And I was craving some real, soul-warming comfort food. My IBS has been terrible recently, so my usual favourite of baked potato topped with oodles of cheese and beans was out of the question. Baked potatoes = comfort food. Homemade chili = comfort food. 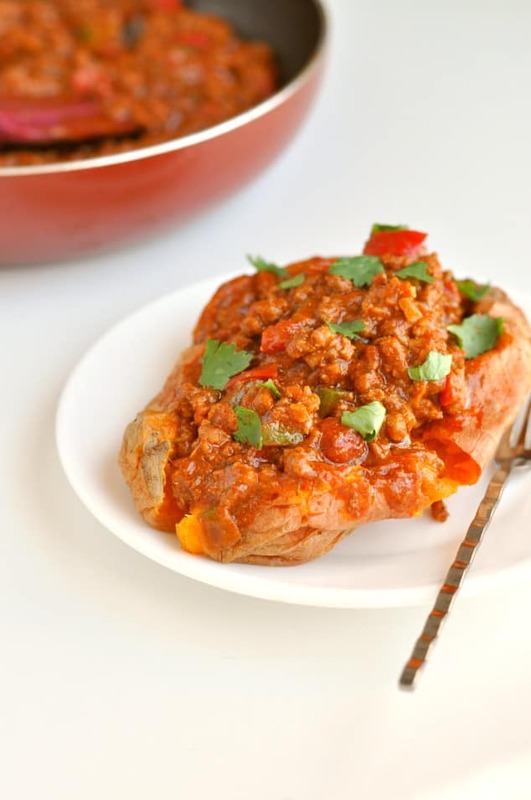 Baked potatoes stuffed with homemade chili = the ultimate comfort food? That’s how my thought process went down and how this healthy baked sweet potato recipe came to be. I’ve got an amazing recipe for The Best Ever Chili and an incredible recipe for 30-Minute Vegan Chili. But because they’re loaded with yummy high FODMAP things like garlic, onions and beans, they were a total no-go. So instead of throwing the towel in, I whipped up a quick and easy low FODMAP chili to top my potato with. If you don’t need to follow a low FODMAP diet, add some diced onion, minced garlic and kidney beans into your chili to make it more interesting. But if you are cutting down on your FODMAPs, know that this chili tastes almost as good as any of my other chili recipes. We’re all winners! I bet this sounds so weird to anyone who doesn’t live in Spain, but you’ve no idea how excited I was to cut into my sweet potato and see its bright orange insides! Around here, the only sweet potatoes I ever find are the ones with red skin and white starchy insides. They taste similar, but they look awful in photos. That’s pretty much the reason this is the first healthy baked sweet potato recipe I’ve ever posted! P.S. 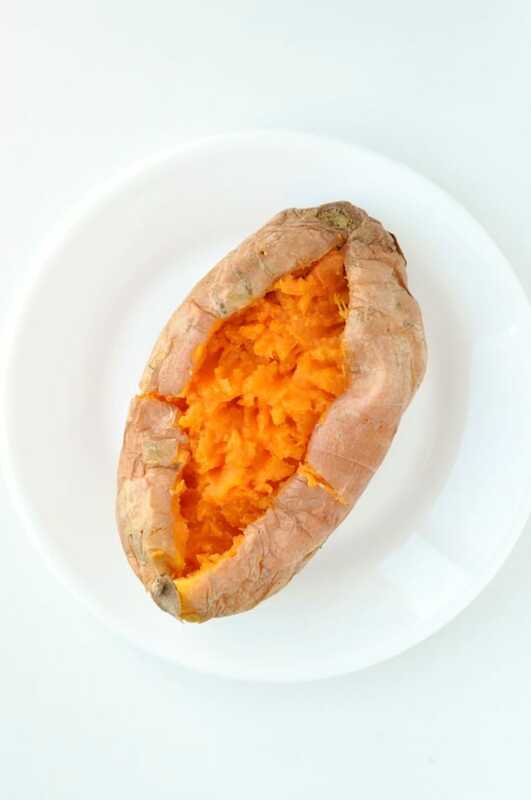 How are you going to cook your healthy baked sweet potato? In the oven or in the microwave? A delicious sweet potato, fluffy on the inside and crispy on the outside, topped with a super quick and easy homemade chili, this healthy sweet potato is my favourite dish to tuck into on chilly weeknights. Prick the sweet potato all over with a fork. Place on a piece of kitchen paper and cook in the microwave for 8 minutes, or until completely soft and cooked through. Alternatively, bake the sweet potato in the oven at 400F/200C for 30 minutes, until cooked through. 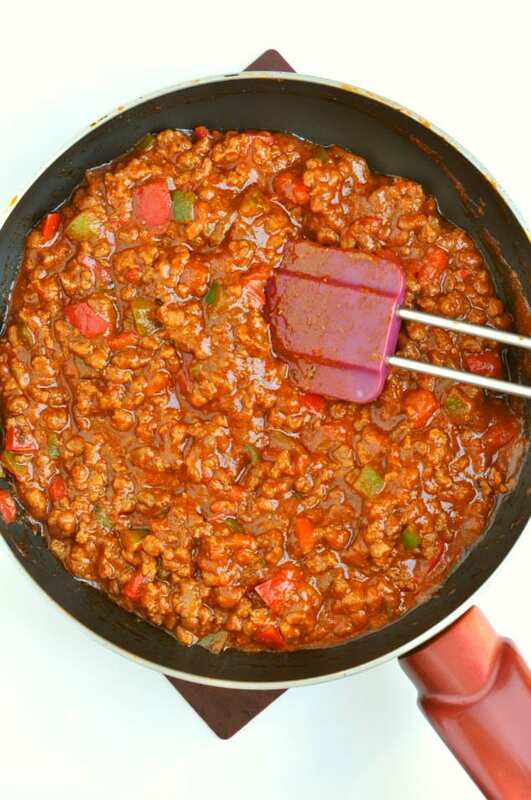 While the potato is cooking, add the mince and bell pepper to a small frying pan over a medium heat. Brown the mince for 5 minutes and drain off the fat. Stir in the rest of the ingredients (tomato sauce/passata, cumin, paprika, chili powder, salt, oregano and cinnamon) and leave to simmer for 10 minutes. 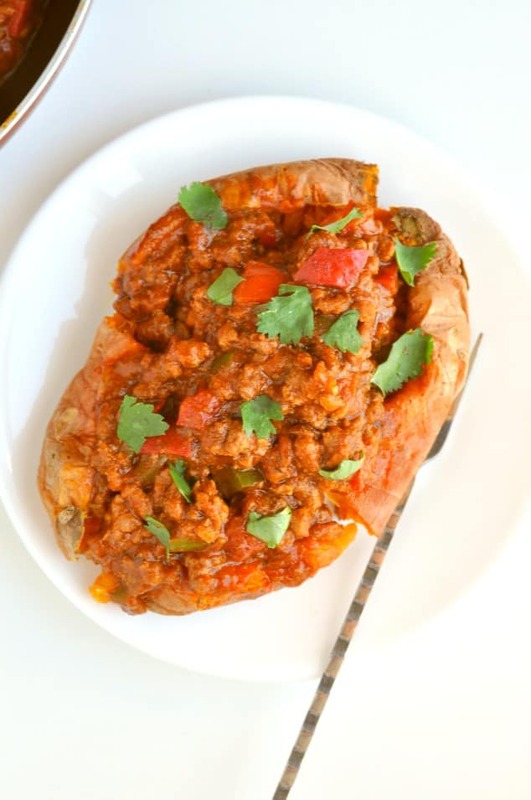 Slice the sweet potato in half, fluff up the insides with a fork and top with the homemade chili. Your sweet potatoes have been beautifully stuffed! I could eat a few of those with that spiced stuffing. I like that you have added cumin, black pepper and oregano here. It looks and sounds fantastic! Thanks so much, Helene! It’s so hard to make stuffed potatoes look pretty! Thanks so much, Amy. It’s become one of my new favourites! This is one of my favourite comfort foods. 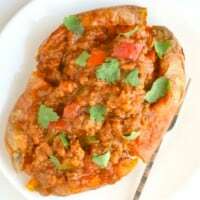 A big filling Potato with a scoop of hearty chilli. Yum! Thanks, Dannii! I didn’t realise how yummy and comforting they are until I tried one. The sweet potato just caught my attention and feel the crave immediately. Yummers! one of my favorite comfort food. Thanks so much, Calleigh! I get instant cravings every time I think about it, too! This reminds me of sloppy joe filling, but in a sweet potato. YUM! I was thinking the exact same thing when I was eating it, Lisa! You can be really versatile with the toppings and still end up with a quick and easy dinner. This is my sort of comfort food! I adore sweet potatoes, they’re so much nicer and more flavourful than standard potatoes. I agree with out 100%, Kate! Team sweet potato!